Statistics for the increase in value of the average condo, townhouse or detached home are usually taken from the total volume of sales (so the combined values of all the properties purchased within the area) and then simply divided by the number of properties sold. This will result in the average value per transaction. Its a legitimate statistic and is a correct one but how can it be used by the public other than the reassurance that the market is healthy? The average value of a home and its statistical increase or decrease in relation to the previous year has in fact very little to do with this number. In fact it merely serves as a guidance as to what to expect from the market in the coming months all things being equal. If the market changes, this statistic is useless. Even if the market is the same, it is not a number that should be used to evaluate a property, not should it be used to second guess any properties increase in value over the coming years. In fact, it shouldn't be used at all as a reliable way to determine if buying real estate is a good investment other than by using its most conservative value of 1% or 2% per annum. The first reason behind this is that there is a difference between purchasing real estate as an investment and owning a home. A home IS an investment but it should not be purchased on that basis. You want a home to be about what you want and your lifestyle, not as the best value you can find unless you happen to luck-in. If you are like most home owners, you will own several properties throughout your life and they will go up or maybe occasionally down depending on the market. However you can't really plan on making money off it because you are largely going to be subjected to the property market around you over which you have very little control. Actually investing in Real Estate is a different game. It is a science based on the original investment and its return, which can be predicted using a much more reliable set of statistics. This is less about what you want but what you can get. You will approach this with your head, not with your heart and this changes EVERYTHING!. Any Return on Investment in real estate is determined based on the purchase price relative to market value, on the rental income, projected rental income, and on a very conservative increase in value of 2%. The purchase price relative to market value is very important as is can immediately produce an increase in your net worth just by knowing what a property is worth. This is much easier with Condos than with houses are large buildings with many sold comparable properties mean that an average value is much more reliable to calculate than with a detached home. The rental income is easy to calculate as in Quebec especially, using a minimal value is quite easy. The bonus will come in the form of an increase in value but we don't need to make such predictions to ensure a viable investment. Mortgage rates are an important factor as the best return on investment will come from borrowing between 70% and 80% of the value of the property to take advantage of current low rates and fix them for 5 years and use the princibles of leveraging to maximise the ROI. With such calculations in mind, the overall Return on Investment over a 5 year period has much less to do with a 5% per annum market growth and much more to do with accurate calculations which will usually reveal between 10% and 15% Return on investment over a 5 year period. The Lofts St Alexandre is a Condo building with many great amenities such as a pool, a gym and a rooftop terrace. 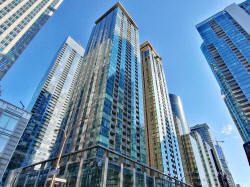 More importantly, it has very low condo/strata fees which makes it ideal for a Real Estate investor. 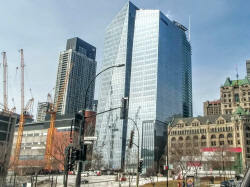 The Deloitte building next to the Tour des Canadiens was the first commercial tower to be built in 30 years. 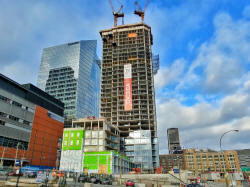 This was the first of several new commercial constructions to go up since 2015 and are a clear indicaiton of a reversal of fortunes in the Montreal economy. The eternal dilemma for the first time buyer is whether to continue renting or to take a leap of faith and buy a property. Well the thing is that it doesn’t have to be a leap of faith at all. It's a decision that can be based on facts, not to mention one's ability to make use of money should you not be using it to invest in Real Estate. 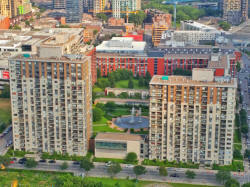 First of all, for being very much involved in real estate, I can say that with a few exceptions, if confronted with the option to either rent or buy today, with a 20% downpayment, your costs of owning a condo (including condo/strata fees, municipal and school taxes) will be roughly the same as renting a similar unit, +/- $100 per month. It would be fair to add though that more often than not, any advantage between renting and buying will be with the tenant in terms of cashflow. Lets not pretend otherwise, it is usualy a little cheaper to rent like for like, than to own a property with a mortgage. So for the purpose of this exercise, let’s say that the tenant is on average $150 better off per month for choosing to rent rather than to buy. This analysis would not be complete if we weren't to also take into account one's ability to generate money with those sums would otherwise be invested in real estate. So let’s use the example a $350,000 condo in Downtown Montreal, and it’s equivalent rental apartment. The expected cost of ownership assuming a twenty percent downpayment of $70,000 with closing costs of $5,000 would be a total of $75,000, and assuming 1% of the value of the condo for taxes and the same again for condo fees, and the cost for a 30 year mortgage for 5 years at 3.49%, the total holding cost would be $3,500 + $3,500 + $1,250 = $1,950. These days, a non furnished one bedroom unit worth $350,000 would rent for around $1,800 (so with a $150 advantage from a cashflow perspective). Lets now take the rental option. There is no capital gain but you are saving $150 per month for a total saved of $1,800 per year. If we assume that you have invested $75,000 in a fund which historically gets 7% annual growth, then this money is earning $5,250 per year. Therefore, on a yearly basis we are looking at $75,000 + $5,250 + $1,800 = $82,050 or 9.4% ROI. So if you start with $75,000, and decide to rent rather than to buy, your net worth will increase by just over half of what it would if you decide to buy a property. I know that funds can get more than 7% ROI sometimes, but Real Estate may also grow more than 2%. This is the interesting part of investing in real estate because any growth in capital gains is based on the value of the property and not on the amount you have invested. So with a 20% downpayment, an additional 1% growth in the value of your property translates into an additional 5% ROI on your original investment. It should also be added that your main or primary residence is not subject to taxes whereas any gains on the value of other assets is usually taxable. The Roccabella building is still top of the searches on Google as it enjoys a top reputation amongs buildlings in the city. 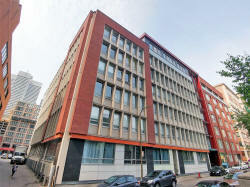 Other popular buildings are Cours Mont Royal, 1200 Ouest, Tour des Canadiens, and Southam Lofts. These are all good pointers as to what buyers are looking for. The Jardins Windsor or Windsor Gardens is a large development in Griffintown (or Little Burgandy). There is significant investment in the area and whilst many new developments are going up just a stones throw away, the are arguable all better equipped with superior materials. It remains to be seen if this is going to help these condos increase in value or if their neighbouring towers are going to make them look bad. They do represent an good return on investment from a rental perspective however. After a very strong performance in 2016 and 2017, and with strong underlying economic data, there was every reason to believe that this year would be even better. Although its difficult to tell at this time of the year and draw any reasonable conclusions, all signs point to yes. The first sign of a strong resale market is that the new buildings (as in’ recently finished’) are selling at a much faster rate than in previous years. To clarify, in previous years, it would take at least twelve months for the values in a new building to settle, and whilst there are still some interesting examples of good deals, sales are strong and values are holding. Of course, the danger in drawing early conclusions for units that were purchased on the basis of their gross square footage and then resold using their net square footage which typically is about 15% less, is that the price per square foot automatically increases by 15% even if the unit is re-sold at the same price. A fact not lost on developers who are a little too keen to make the most of such statistics. Budgets are noticeably higher than last year , by at least 20% for Downtown Montreal, though this doesn’t automatically boost values at the lower end of the price range, it does help in increasing prices in the middle range and this will eventually push prices up all across the entire spectrum. Baby steps... Montreal is about to make it to the big league so lets not rush it. Although down in numbers, presumably due to the increasing shortage of land on which to build, new projects are still bring planned in all parts of the city. This will translate into an increase in values as these will inevitably sell for a higher price per square foot than their predecessors. Overall, the only question is how the rise in interest rates will affect buying power and the ROI ( return on investment) for investors. In three months, and with the spring season behind us, we will have a much better idea, but at the risk of being smart after the event. The future belongs to the bold. Delaying your purchase is effectively betting against the market, which based on current data, would be unwise. The Tour des Canadiens Phase 2 is in its closing stages with most of the structure being erected. However, bad press on Air B&B and short term rentals as well as a question mark over the boast of it being the 'best investment in the city' may be the cause for a decline in sales for Phase 3, as well as competition from earlier buildings. The Windsor Quad commercial development will bring hundreds, if not thousands of jobs to the area between the downtown core and Griffintown.